Copper engraving by Tookey from a work by Malcolm. No date, but before 1791. Published in "The European Magazine" 1782-1826. 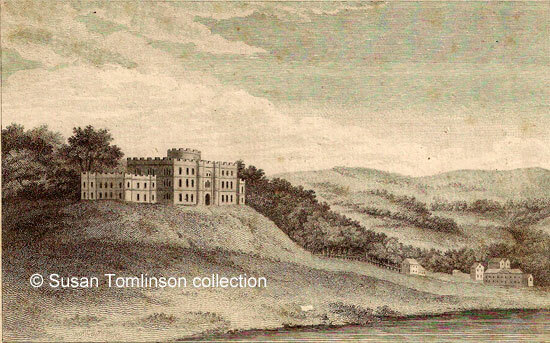 Whilst the engraving is called "Cromford Hall" this image is clearly a picture of Sir Richard Arkwright's Willersley Castle. Curiously, the house has neither roof nor chimneys and where there should be a front door is a black hole. Both these factors probably indicate that his mansion was still being built, rather than in the final stages of completion - so neither immediately before before nor after the fire that occurred in 1791. "On Monday se'nnight the new mansion house belonging to Sir Richard Arkwright, at Cromford, near Matlock Bath, in Derbyshire, was discovered to be on fire, occasioned (as it is supposed) by the fire in the stove being made rather too large ; the heat of which was communicated by tubes conveying the heat through various rooms. Every assistance was given by the people of the country, with a couple of fire engines ; yet, notwithstanding their endeavours, that stately fabrick that has been years erecting, and nearly finished at the expence of upwards of twenty thousand pounds, was demolished in the space of a few hours. Some of the furniture in the lower apartments was saved. 'Tis truly a great trial to any person to see such a noble edifice destroyed after such labour and expence, yet we have heard that Sir Richard beheld the fatal conflagration with great patience, fortitude and resignation, to the wonder and surprise of the company assembled on so melancholy an occasion". Enlargement of the main house. "It is my express will and direction that my said son [Richard Arkwright] shall with all convenient speed after my decease complete in a proper manner the mansion house I have lately erected and also in a like and proper manner complete and finish the Chapel I have lately built ...". "One minute's ride conveys you from Cromford [Marketplace] to the first opening into Matlock Dale, which is immediately observed on passing between two rocks, through which the road has been cut, with indefatigable labour and perseverance. Here, turning the eye to the right, the elegant villa belonging to the family of the late Sir Richard Arkwright appears to more than common advantage. The beautiful freestone of which it is built, with its modern castellated front, causes the mind to contemplate the happy taste of its first founder. - A gentleman, who, by his extraordinary mechanical talents, raised himself from the lowest to the highest scale of commercial importance ; and who has undeniably been of more real service to his country than the greatest heroes of ancient or modern history. Let his triumphal arch, therefore, be erected on the gratitude of his country, and his memory be ever dear to the Briton who wishes its commercial prosperity and welfare". It is unclear why the mansion was named as Cromford Hall here although it could be because the house didn't then have a name. We see a somewhat different Willersley Castle in the engravings below, published in "The Beauties of England and Wales", 1802. The house had been finished by then. Cromford, about 1773. This also shows mill buildings. Copper engraving of "Cromford Hall" in the collection of and provided by and © Susan Tomlinson. "Stamford Mercury", 19 August 1791. Extract from the Will of Sir Richard Arkwright held at the National Archives (ref: PROB 11/1222 234). There was a smelting mill at Cromford Bridge that pre-dated St. Mary's chapel (see Buxton, Doreen and Charlton, Christopher (Nov 2013) "Cromford Revisited", The Derwent Valley Mills World Heritage Site Educational Trust. ISBN 978-0-9541940-6-2) but there are no chimneys here, hence the assumption that these are cotton mill buildings. So artistic licence rather that 100% accuracy. Hutchinson, John of Chapel en le Frith (1810), "Romantic Beauties of Matlock", pub. M. Wardle, Manchester.